Manufactured Home Floor Plan. The K865 Hampshire Elite. The K865 Hampshire Elite Manufactured Home Floor Plan has 1369 square feet of comfort. These floor plans are called Elite for a reason. With so many standard features, these homes are built very comparatively to site built construction. Finished drywall is standard in the living areas and master bedroom. This home has a formal dining room adjacent to the great room and is very spacious and elegant. Large closets in each bedroom for plenty of clothes storage. 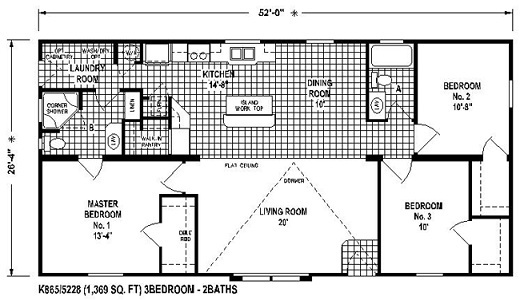 This floor plan can also be built as a 2 bedroom.